Sir, the name of Thucydides, Son of Olorus, has appeared in the Financial Times three times in the last eight days. Three times it has been accompanied by grave errors interpreting the relevance of his thought to the current European situation, which I will address in chronological order. Okay, so classical political philosophy is about the soul and nomos, while modern political philosophy is about the moral consciousness. Hmm…. The Thomistic interpretation is connected with the view that there is a habitus of practical principles, a habitus which he call “conscience” or, more precisely, synderesis. The very terms show that this view is alien to Aristotle; it is of Patristic origin. I’ll note only two circumstantial coincidences. The Platonic chariot appears in a dialogue that occurs outside of the city walls. Maimonides notes that the Account of the Chariot (III 6) implies an understanding of its audience as being outside the city: comparing two mean, one from a settle population and another from desert nomads, “the former knew that city people know in what state the ruler rides, [Isaiah] did not describe that state, but said only: I saw the ruler…whereas the people of Exile required these details [from Ezekiel].” The biblical Chariot, like the Platonic one, is outside the city. The biblical Chariot is a picture that is only possible outside of the Second Table, outside of the “minimum requirements for society” (NRH 158). The second circumstance: I usually write in this space in the dead of night, seeking the morning sun; at this moment, I am writing in the middle of the afternoon awaiting the evening dusk. p.s. 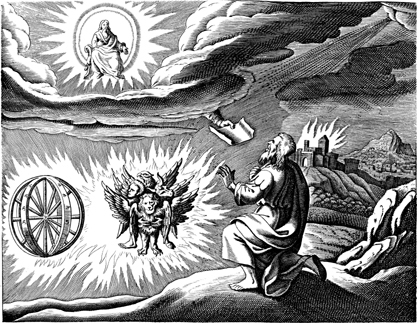 Origen postulates a parallel between Ezekiel and Christ on the basis of Luke 3:23, Matthew 3:13, and Luke 3:21. See the Scheck translation, p.32-3. p.p.s. There are many, many, benefits to the current fashionable love for habitus, doxa, and field in my academic community. But much, much more resides on the surface of these concepts than their first impression admits. And the first impression is already powerful. I’m currently treading water trying to make sense of Aristotle’s political philosophy, on account of my preference for the Rhetoric and of my inability to set aside my curiosity regarding the doctrine of the moral conscience. Of course, how can one set either of these aside given the current climate’s love for recent iterations of habitus? Soon, very soon (I alway say this don’t I?) necessity will force itself upon me and I will get to return to Thucydides’ History. This time, however, “time” will be on my mind as I read. Thucydides uses the “natural” calendar of summers and winters to chronicle the war. Strauss (CM, 227n88) provides some hints for understanding Thucydides’ hints. Some attention will also be paid to what I can only very clumsily call the “Periclean biopolitics” of the plague and stasis. While reading Seth Benardete’s essay Socrates and Plato: The Dialectics of Eros I stumbled across the most fantastic quote. Quote: “…negation is always the other of the other (Sophist 258a4-5). Philosophy therefore tends to become conspicuous at the boundaries of things, where it binds together what seems to be apart and separates what seems to be together.” Someday soon I hope to formulate some thoughts on Being, inside/outside, and philosophy being “on the line”. Perhaps while discussing the quid sit of securitas? Securitas is a freedom from anxiety – freedom from angst – or composure. It is also the name of a minor Roman Goddess or personified as the “tutelary goddess of the Roman state”. Security and Political Theology always, always, go hand in hand. To wit: ti esti nomos? p.p.s. Blushing is the surface that reveals the heart of things. p.p.p.s. Is philosophy the seaming of seemingness?